University of Maine goaltender Jeremy Swayman (left) makes a save during a game on Oct. 8. The sophomore made 44 saves in Saturday night's 1-0 Hockey East loss to UMass Lowell. ORONO, Maine — The only thing close about the University of Massachusetts Lowell’s 1-0 Hockey East victory over the University of Maine at the Alfond Arena Saturday night was the score. The visiting River Hawks (4-4 overall, 1-2 HE) dominated every aspect of the game, outplaying and outworking the Black Bears from start to finish. The tenacious River Hawks played with tremendous energy and kept the hosts penned in their zone most of the night while doing an equally impressive job breaking the puck smoothly out of their own zone. 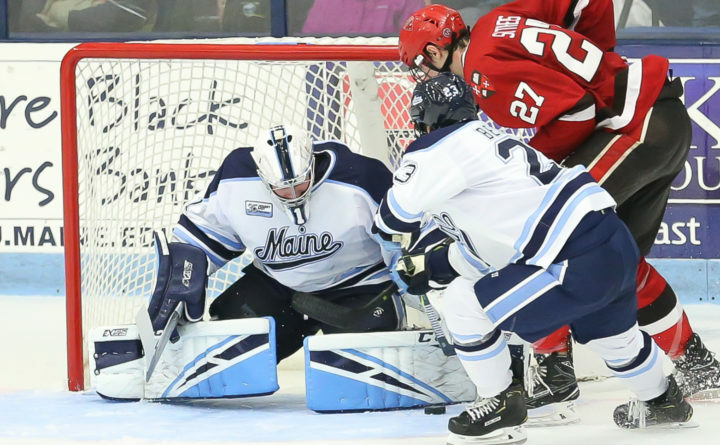 Only the spectacular goaltending of sophomore Jeremy Swayman, a Boston Bruins fourth-round draft pick, kept UMaine (3-4-1, 1-2-1 HE) from getting blown out. Swayman finished with 44 saves, including 28 Grade-A (high percentage) stops, as the Black Bears were outshot 45-24. Sophomore left wing Connor Sodergren was credited with the game’s only goal 5:32 into the third period. Senior goalie Christoffer Hernberg made 24 saves, including 14 Grade-A’s, in notching his sixth career shutout. The Black Bears again hurt themselves with penalties, giving the River Hawks seven power-play chances including three over the game’s first 9 minutes, 37 seconds. UMaine killed all of them off, but the early power plays gave the River Hawks momentum and they never lost it. UMaine had a golden opportunity to break the scoreless tie when UML’s Jon McDonald was assessed a five-minute major for contact-to-the-head penalty with 52 seconds left in the second period. But only 33 seconds later, UMaine junior center and Chase Pearson, who had two goals on Friday night, was assessed a two-minute cross-checking penalty. Pearson spent virtually the entire third period on the bench. “I was pretty angry with the penalties. That’s why people didn’t play who you thought should have been playing,” Gendron said. Sodergren’s goal was set up by a pass from Charlie Levesque. Sodergren cleverly maneuvered through the middle of the slot and he fired a 25-foot wrister that eventually wound up in the back of the net. Swayman thought he had a chance to get the goal overturned, but the video review upheld the goal. UMaine’s Tim Doherty had a second period breakaway courtesy of a Sam Becker pass but he shot wide of the stick side to Hernberg’s right. And Mitch Fossier had a terrific chance to tie it with 12:25 remaining in regulation when he was set up nicely by Ryan Smith on a 2-on-1. But Hernberg read the pass and made a great save on Fossier’s 16-foot one-timer from the middle of the slot. UMaine, which attempted 44 shots to UMass Lowell’s 74, has next weekend off before visiting Boston University for two games Nov. 16-17.